60 when the architect N.S. Neblung added another storey to the building. Vartov is known chiefly because N.F.S. Grundtvig served as its hospital chaplain in the mid-1800s. The hospital was in operation until 1934. 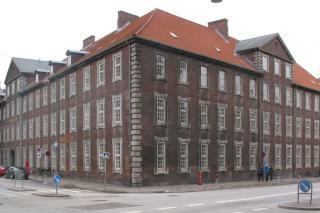 Since 1947, the building has housed Kirkeligt Samfund, the headquarters of the Grundtvigian Movement in Denmark. Nikolai Frederik Severin Grundtvig (1783-1872) is regarded as the father of Danish popular enlightenment. A theologian, he was also an industrious writer, polemicist and politician. As the pastor of Vartov Church for more than 30 years, from 1839 to 1872, he attracted a large congregation and his psalms became national standards. Vartov Church is the cradle of the Grundtvigian Movement and the folk high schools which provided residential adult education. The Danish hymn book contains more hymns by Grundtvig than any other hymn writer. He was much preoccupied by national culture, including Danish popular songs. He was a member of parliament from 1849-58, instrumental in the development of the folk high schools and director of Dronning Caroline Amalies Asylskole, a day nursery for children run according to the Grundtvigian educational doctrine. Meanwhile he continued to write books and sermons.